All this time I thought Roald Dahl was just a horrible narcissistic monster who treated his family badly and hated kids generally. In fact, he had a tragic life irreparably scarred by the suffering and young death of his children. I mean, it's just wrenching. 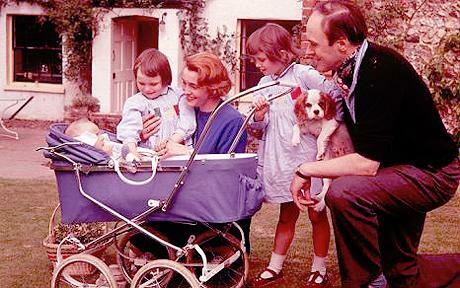 In 1961, Dahl was married to the American actress Patricia Neal. [She was Paul Varjak's sugar mama in Breakfast at Tiffany's, which was released that October.] That summer the family was in NY, three kids, two girls and a baby boy, and a taxi struck the kid in his pram. After months of uncertainty, he survived, but ended up with lifelong brain injuries. This is what the family was dealing with into 1962, when their oldest daughter Olivia contracted measles in November at the age of seven. After a couple of days of fever, she seemed to be on the mend. Then she started having nerve problems; she was rushed to the hospital. She was diagnosed with measles encephalitis, untreatable, and died within twelve hours. I first said I would stay on. Then I said I'd go back with Pat. Went. Arrived home. Called Philip Evans. He called hospital. Called me back. "Shall I come?" "Yes please." I said I'd tell hospital he was coming. I called. Doc thought I was Evans. He said I'm afraid she's worse. I got in the car. Got to hospital. Walked in. Two doctors advanced on me from waiting room. How is she? I'm afraid it's too late. I went into her room. Sheet was over her. Doctor said to nurse go out. Leave him alone. I kissed her. She was warm. I went out. "She is warm." I said to doctors in hall, "Why is she so warm?" "Of course," he said. I left. The account wasn't published until 2010. Olivia's death haunted Roald and his family for the rest of their lives. Their second daughter Tessa wrote in 2012 about the emotional and psychological trauma of her childhood, and its impact on her adult life. Dahl dedicated The BFG to Olivia, and published it on the twentieth anniversary of her death, in 1982. Its main character is named Sophie, after Tessa's daughter. But connections to Olivia resonate throughout the story. Edwin Turner made me cry several times as he described reading The BFG with his daughter, and how it reminded him of Dahl's own anguish as a father. In 1986, Dahl wrote an open letter to other parents about his daughter's death, encouraging them to get their kids vaccinated. It continues to circulate under the title, "Measles: a dangerous illness," at The Encephalitis Society and Oxford University's Vaccine Knowledge Project. Believe me, it is. In my opinion parents who now refuse to have their children immunised are putting the lives of those children at risk. In America, where measles immunisation is compulsory, measles like smallpox, has been virtually wiped out. Here in Britain, because so many parents refuse, either out of obstinacy or ignorance or fear, to allow their children to be immunised, we still have a hundred thousand cases of measles every year. [Since this was written in 1986, the success of the MMR vaccination has reduced this figure to several thousand each year, but unvaccinated children are still at risk, and some do still die of measles]. Dahl's letter has gotten a lot of online attention in the last couple of days. Don't turn out like Roald Dahl. Vaccinate your kids.